This new series of talks ‘In the Beginning was the Word – and they spoke in tongues’ will focus on ancient languages which became relevant to particular Christian communities in their historical and cultural development but are much less known than languages such as Latin or Greek. Some of these ancient languages actually became more than just liturgical languages, turning themselves into a trademark of some communities, as it is the case of Slavonic for some Eastern churches. Moreover, they function as a reminder that the diversity inside the Church goes back to its very foundation, as portrayed at the Cenacle by the image of the disciples speaking in different languages but understanding each other. Some of these ancient languages, such as Coptic or Slavonic, are still used today by their religious communities, whereas others, such as Gothic or Old-Nubian, are only known to us from leftovers of New Testament translations or other ancient Christian texts. 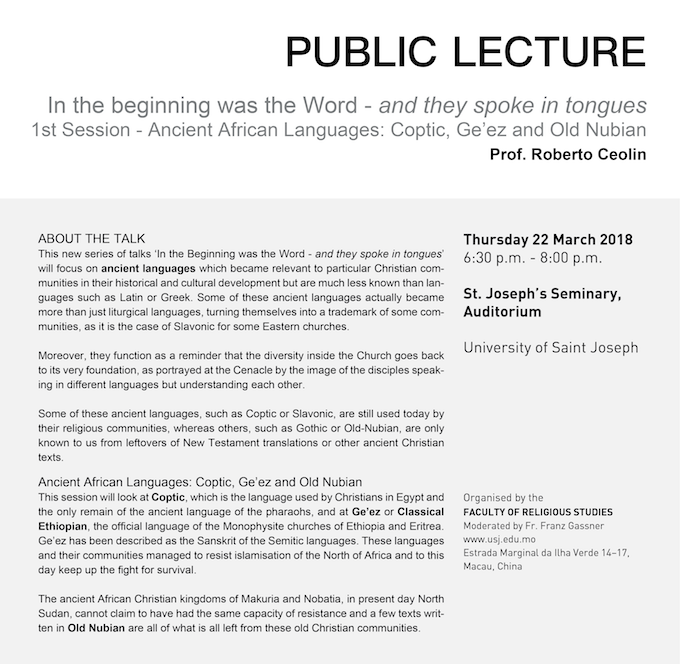 This session will look at Coptic, which is the language used by Christians in Egypt and the only remain of the ancient language of the pharaohs, and at Ge’ez or Classical Ethiopian, the official language of the Monophysite churches of Ethiopia and Eritrea. Ge’ez has been described as the Sanskrit of the Semitic languages. These languages and their communities managed to resist islamisation of the North of Africa and to this day keep up the fight for survival. The ancient African Christian kingdoms of Makuria and Nobatia, in present day North Sudan, cannot claim to have had the same capacity of resistance and a few texts written in Old Nubian are all of what is all left from these old Christian communities.